I started the #30daysmagicalroots challenge to get back to basic Magick and build up a practice which incorporated my heathenness. To some extent, with the challenge itself, that was successful. When it came to some of the specific challnges, plants and stones, spellwriting…it felt forced for my purpose. My daily practice started to slip away as the summer break wound down. Daily libations began to feel rote and routine which made them lose their meaning. My libations aren’t what are connecting me to the gods. My thoughts and actions done with meaningful integrity in my daily life. Who I am to my children is the best honor I can give to Frigg. Who I am to my husband is another honor to Frigg. How I interact with those around me: am I hospitable and generous? Do I take a stand and follow what I believe in? I realized something while I was spending a quiet, tech-free weekend at a lake house with family: my crocheting has increased exponentially since I started again…and it’s been 4+ years. I could almost make a straight edge rectangle years ago. Now, I can make intricate designs without following a pattern. This crocheting, this wool work, is a libation to Frigg. Every time I look at the sky and see wispy clouds and am reminded of her weaving is a libation to her. Every time there is a storm, and I recognize Thor at it’s center is a libation to him. Every night at beg time when I share and Asgard story with my daughter is a gift to them. This week, I will be bringing a large crow feather, which I found on campus many years ago, into my classroom and inviting Odin to join me as I return to my instructional position. Intentions of this challenge have been met. Keep on going with my practice and my gnosis. It may not always be a clean fit, but if done with integrity, it will be done right for myself and for my honoring of the gods. The challenge for day 10 is to find a plant with whom you connect. This is something I’ll have to think more about. I want to connect with lavender. The lavender seeds I planted earlier this year didn’t grow, however. The sunflower seeds did, big time. Sunflower is another favorite plant of mine. I’ve also always liked clover. I will be thinking about this more as I continue to work with plants and soul in my gardening adventures. My daily practice is two-fold: libations to Frigg and a yoga flow and/or meditation. In the last few weeks, I have been making [almost] daily libations to Frigg. I have a lovely blue and white ceramic bowl in which I make powdered milk in the morning. As I go about the day, I pause to look at the milk and think about my connection with Frigg. In the evening, the Littles help me pour out the milk into the front garden, not far from Witchlette’s Fae house. Witchling specifically enjoys helping me with “bations”, always beginning with “Blessed Frigg”. Daily offerings to Frigg are designed for her so they align with her. Yoga, however, is a bit less clear. Yoga is an Eastern tradition, which I have been doing with some regularity, on and off between kiddos, since I was first discovering my path 10 years ago. While yoga is not something Frigg would have known and would have practiced, but I am able to reconcile each of these practices with the other. I use yoga to align my spiritual, mental, and physical health. I use yoga to help me get into a meditative mind frame to allow Magick to flow. As a seider, a seeress, this is something Frigg would have done herself. Different methodologies perhaps, but the same result. Perhaps Frigg manifested today would be a Yogi. After day 7, I noted that I was going to let go of all my excuses and do daily morning yoga again. That evening, I charged both my iPod and my speaker. But I left them plugged in downstairs over night and didn’t have them to do yoga yesterday morning. I almost forgot them downstairs again last night, but got out of bed to go downstairs and retrieve them. I set them up at my altar to be ready for yoga this morning. Best laid plans… At about midnight, I gave up on Witchling spending the night in his own bed. Between the spill he took yesterday which left him with a knot on his forehead and the cold he is beginning, he needed to be held and unless he was in bed with us, I wasn’t going to get any sleep. Some sleep while being pummeled by a toddler is better than no sleep at all in my book. Yet, with him with me, there would be no yoga this morning either. Tomorrow will be another try. 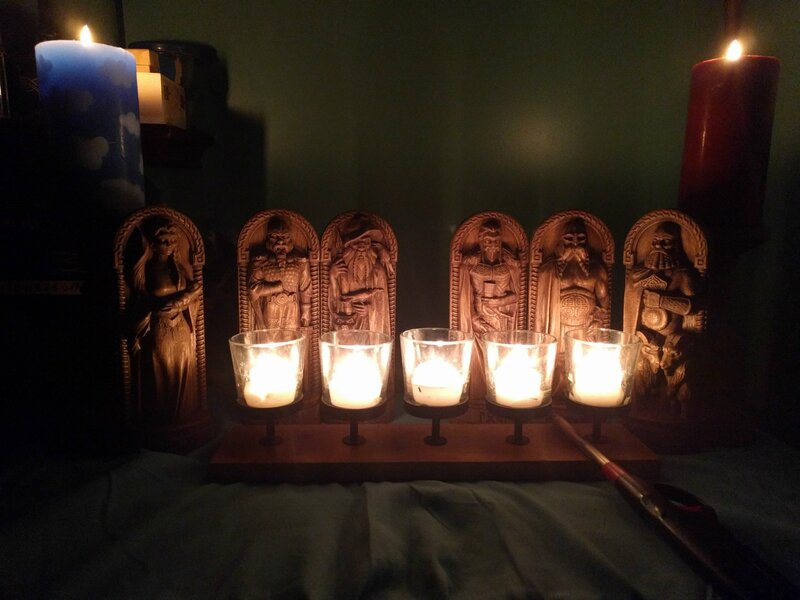 Between the libation to honor Frigg, which has included grounding and centering, and the impending return of morning yoga, I believe I’m in a good place for my spiritual health. …not sure what’s going to come of the daily libations when the school year starts again… We shall see! I have reviewed here on countless posts how I enjoy starting my day with yoga, and how I haven’t done it in so long because of countless excuses. I also no longer do yoga at night because I don’t pull away from other things before I’m too tired. The past few days, I’ve been saying I will get my music player- as opposed to music on my smartphone- charged and that will help. Because I will no longer be tempted to do social media of all I have is music. It’s the music I feel the most comfortable meditating to and doing yoga with. Once I hit post, I’m going to dig it out and charge it up. Tonight, in response to the challenge, I decided to go big or go home. Take the next 20+ days of doing a pose daily and see some improvements. My dancer pose felt more like a hamstring stretch. My knee is more bent and my hips are not that open. But tonight was only night one. A psychic shield is one of the best, strongest, most basic tools any witch of any practice can have. I will never forget when, about three years ago, when my local Rune Guy spoke to his class at Pagan Pride Day about shielding while working with Runes. Up until that point, I had envisioned shields as something different. I can’t really describe what, just different. It was not something I really understood or something I ever did. Tonight, in raising a shield, I started as I normally do with grounding. I visualize a yellow, blindingly bright light, very small, floating just within my chest. With each inhale, it grows larger and expands again and again until I am in a carry yellow bubble. At the same time, I am seeing the outer walls of my home growing with thick vines (think Seeping Beauty growth). Between the two, I am personally guarded and my home is guarded while I am working inside.